In each unit, the Language in Use grammar sections typically follow an inductive or “discovery” approach drawing on learners’ existing knowledge. Students focus on the forms of the grammar through the presentation of simple, everyday examples. These exercises guide students to make connections between grammatical forms, functions and the meanings they signal. Grammatical patterns are then recycled throughout the rest of the units to maximize reinforcement and repetition. 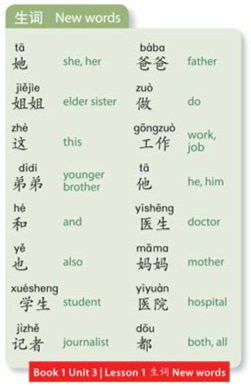 Additional support for each unit consolidates basic Chinese grammar. Grammar Reference gives understandable but detailed references to key points. Vocabulary is clearly and systematically presented with words appearing in the same order as in presentation dialogues and reading texts. Vocabulary is tightly linked to the themes and topics covered in the units.